Today Christians celebrate el Miércoles de Ceniza (the Ash Wednesday). 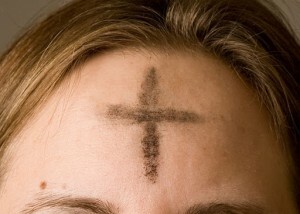 They get a a cross of ashes placed on their forehead. This sign symbolizes that somos polvo y al polvo volveremos (we are dust, and to dust we shall return). In this way, la Cuaresma (the Lent) starts. From today, we’ll have forty days to purify our souls, until la Semana Santa (the Holy Week). On www.spanishviaskype.com, we don’t only want to deal with trivial or carnal topics as we did two weeks ago, but also like to talk about deeper matters. Our students of Spanish via Skype already know how Catholicism has influenced our language. Today, we’ll learn some idioms related to la Pascua (Eastern) and la Semana Santa. Pascua, of course, is one of the most recurring word when we talk about religious idioms. La Pascua is the the Resurrection Sunday, the central dogma of Christianity. Is a workmate conspiring against you? Te está haciendo la pascua (literally, “he is making the Eastern to you”), he is bothering o disturbing you. It’s been a long time since you saw that relative of yours for the last time, hasn’t it? You see him de pascuas a ramos (from Eastern to Palm Sunday). Palm Sunday represents Jesus’ triumphal entry into Jerusalem; so, this idiom expresses the frequency of an action: once a year. To finish with Pascua, we could say, y santas pascuas (literally: and Holy Eastern). In this way, we can finish a conversation because there is nothing more important to say. Cruz (cross) is another Christian symbol with many uses in Spanish. Back again to work. Do you always have to deal with the hardest work because nobody wants to do it? You always cargas con la cruz (literally, to carry the cross). If someone tells you eres una cruz (you are a cross), maybe you should think about what you are doing wrong with that person, because it’s being a heavy load for him. Don’t you want to be involved in such an annoying matter? You can say: me lavo las manos (I’ll wash my hands). This frequent habit is what Pontius Pilate did when he had to decide Jesus’ future. Judas couldn’t be missing here, today. He betrayed Jesus and was discovered by him during the Last Supper. As you may imagine, all the idioms about him are negative. Ser un judas (to be a Judas), ser más falso que Judas (to be falser than Judas). But the most curious one is when someone you fear or hate does something favourable for you. At that moment, you could say: ese es el beso de Judas (that’s Judas’ kiss). Jesus was kissed by him just before he was caught by the Sanhedrin. Here there are just some examples of how religion has influence on Spanish. We don’t want you to speak Spanish de Pascuas a Ramos nor Spanish sea una cruz para ti, that’s why nosotros no nos lavamos las manos with you and nunca seremos un judas. Don’t hesitate and reserve a free trial lesson with us, y Santas Pascuas.